This roasted salsa verde is full of flavor and is a fantastic Whole30 salsa for your warm weather Whole30. Packed with roasted tomatillos, jalapeño, poblano pepper, and tomato, this garlicky Whole30 salsa will become your new favorite salsa verde, I pinky promise. Of course, it’s not just a Whole30 salsa – it’s a “for everybody all the time on everything” salsa, too. Just saying! Comes together perfectly in my favorite food processor. Salsa verde isn’t my favorite. No, I prefer the smoky varieties that come delivered alongside their green sibling: the depth, the garlic, the richness. I’ll take a bowl of the deep red sauce over the bright green stuff any day. Except, of course, on roasted salsa verde (AKA perfect Whole30 salsa) day. If you’ve ever done a Whole30, you’ve probably ended up at Chipotle once or twice, having scoured the interwebs for compliant restaurants because you are just so freaking tired of making mayonnaise. So you find yourself at Chipotle, ordering a carnitas salad bowl topped with tons of salsa and extra guac. “Yeah, I know guac is extra,” you say. “So how much?” they ask. “As much as you can legally give me,” you reply. It’s cool. You need flavor in your carnitas bowl, and you can’t have cheese, so. So… salsa. Whole30 salsa, which, of course, is actually salsa otherwise approved for everyone, but it doesn’t have sugar in it and everything has sugar in it (or so you have realized by day 2), so you’re really freaking excited. And this roasted salsa verde they have at Chipotle? It’s actually kind of delicious, with its black flecks of charred flavor dotting the deeper green sauce. That roasted salsa verde inspired me when I felt inspired to recreate the Whole30 favorite, carnitas bowls, at home! We tired of eating chicken salad out of the plastic container every day and opted, instead, for a week of filling, ridiculously flavorful carnitas bowls à la Chipotle. But, of course, you can’t have a Whole30 carnitas bowl without Whole30 salsa (and freaking tons of it), right? 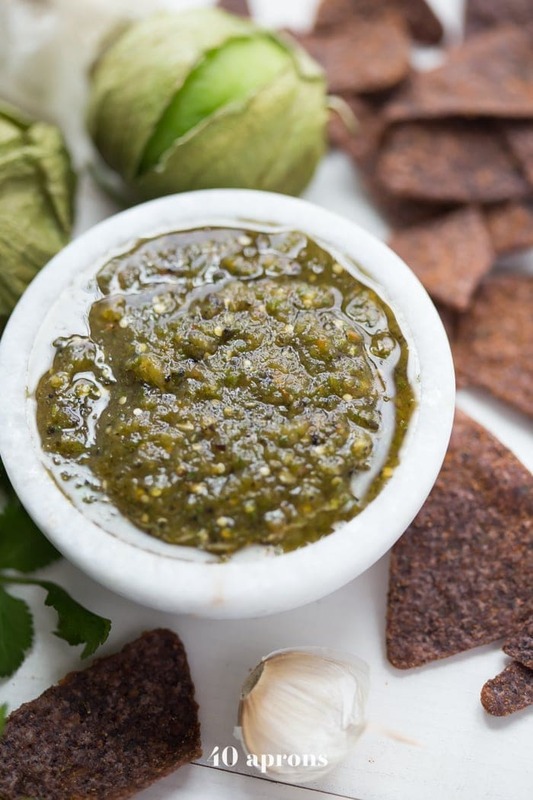 Enter… the roasted tomatillo salsa. I knew I wanted to deepen the flavor by roasting everything, including a jalapeño and a poblano pepper, but I kept the garlic raw for a bit of extra garlicky flavor and bite. There’s plenty of cilantro and even a bit of white vinegar, which I find adds the perfect tang to so many Mexican sauces, like my awesome avocado salsa (another fab Whole30 salsa you should pin right now, pretty much). It’s perfect with chips, if you’re not doing the Whole30 thing, and a fantastic base for a tortilla-less soup, if you are. Drench everything in it, especially my Whole30 carnitas bowls. Oh, and make sure you’re subscribed so you don’t miss more delish paleo and Whole30 recipes! 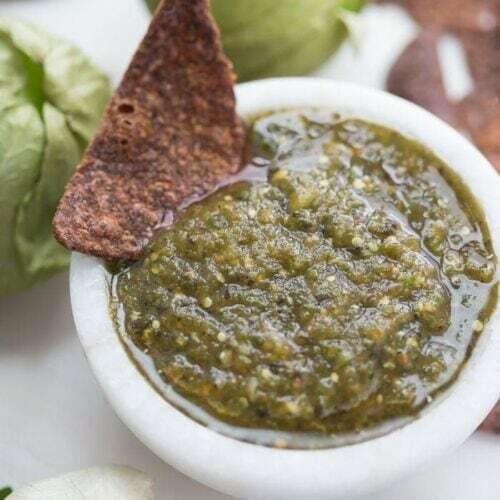 You’ll love this roasted salsa verde because it’s got the richness and major flavor that it’s so easy to miss in regular salsa verdes. And if you’re doing a round, this might just become your very favorite Whole30 salsa! 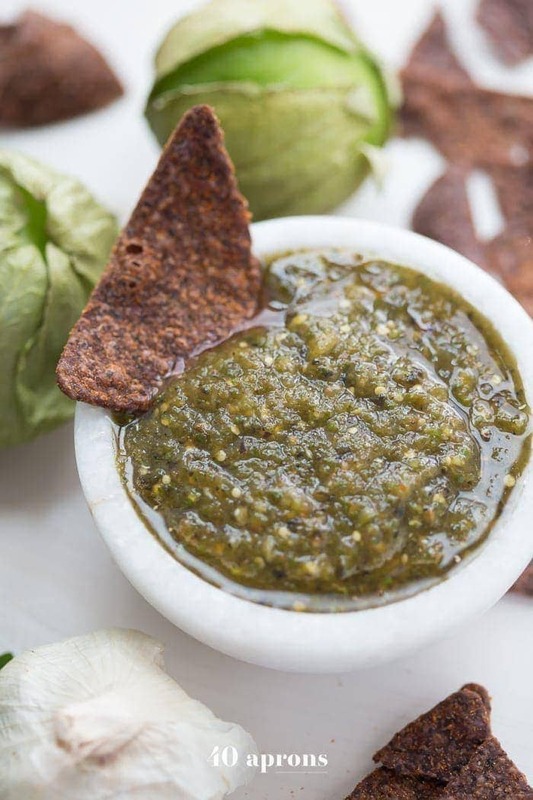 This roasted salsa verde is full of flavor and is a fantastic Whole30 salsa for your warm weather Whole30. 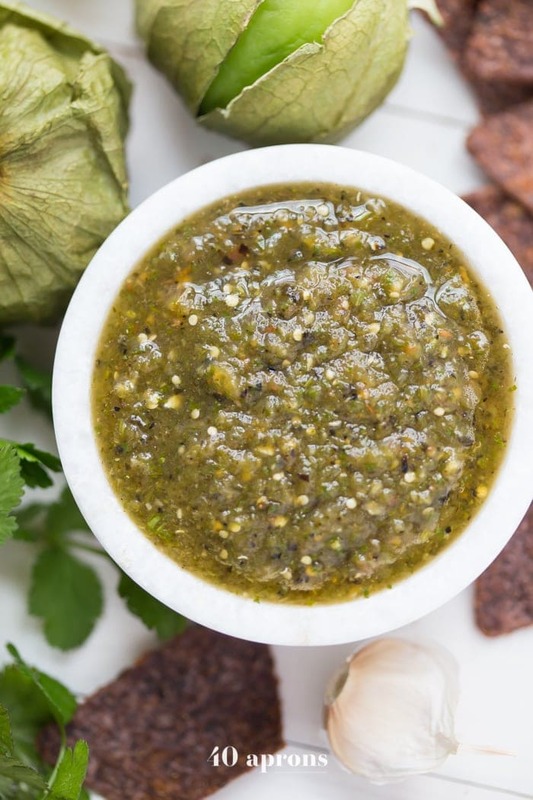 Packed with roasted tomatillos, jalapeño, poblano pepper, and tomato, this garlicky Whole30 salsa will become your new favorite salsa verde, I pinky promise. Preheat broiler. Place tomatillos, jalapeño, poblano pepper, and onion on baking sheet. Broil until blackened and charred, turning with tongs to ensure all of skin is blackened. Remove from broiler and let cool slightly. Pull stem of poblano out and remove seeds as well. Discard. Transfer tomatillos, poblano, jalapeno, as well as Roma tomato, garlic, 1/4 cup cilantro, white vinegar, and salt to food processor. Process until pretty uniform. Taste and add more cilantro or salt, if desired. Process until desired texture. Use the jalapeño to customize the spiciness. Remove seeds and use only half a jalapeño if you want a mild salsa. Keep seeds in pepper and use entire jalapeño if you want it a bit spicier! Keep in airtight container in the fridge for 2 weeks. This recipe sounds lovely but … what would I serve it with (as in what proteins or what vegetables)? 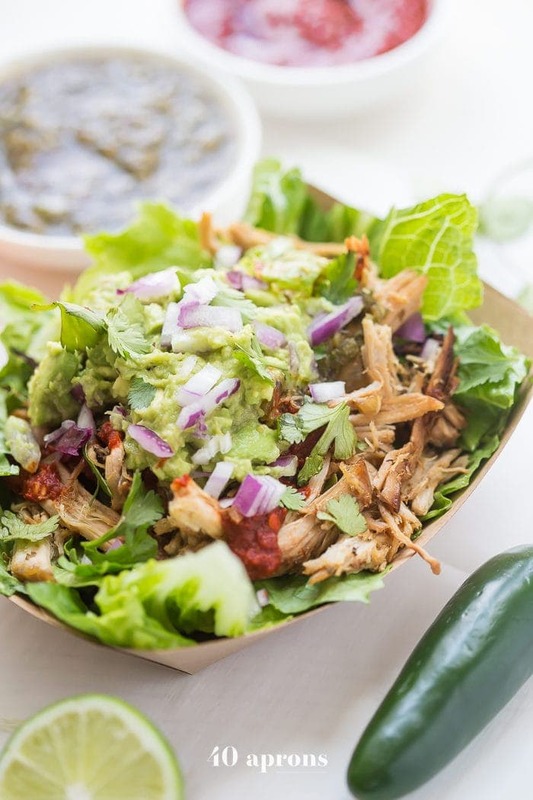 It’s fantastic over grilled chicken, carnitas, and on taco salads!